In 1996 the post-jobs world of Apple was searching around for ways to spread their PowerPC platform. Seeing how consoles had integrated into so many living rooms they decided that this was the direction to go. So, working with Bandai, they developed the Pippin Platform. This platform was based on their existing Power Mac computers. The Pippin was a hugely powerful machine and included numerous options that no other console had. These included the ability to be used in PAL or NTSC out of the box and they had a built-in VGA port as well as the usual composite jacks. Bandai released the Pippin in Japan as the ATMARK and in the US as ATWORLD. These machines were largely identical except the US one was black from the start and the Japanese release was white. In Europe Katz Media released a slightly improved machine with more memory. The Pippin was incredibly expensive at release, unsurprising seeing as it had such a powerful spec. But despite that it couldn’t compete well with the Playstation or Saturn. Nobody wanted to buy a machine that was weaker and more expensive. The Japanese version is easiest to get hold of, the US version is rare and the European version is nearly impossible to get. The Pippin came with internet access built-in, via a phone jack. The controller, called the Apple Jack, had a built-in trackball to help you navigate web pages. The community has since released a version of Mac OS 7 that can be booted, pretty much making the Pippin into a working Macintosh. After the games crash Atari struggled to make ground in the new videogame world with the death of the 2600. After several attempts they started to concentrate on computers instead. Until two engineers from a company called Flare approached them with a hardware platform they’d been developing. Atari were already working on a project called Panther at the time, but decided to ask the Flare team to develop their platform under the codename Jaguar. Panther wasn’t progressing as well as Atari had hoped, so they cancelled the project and went full steam ahead with the Jaguar. The machine was released, to fairly underwhelming reviews, in 1994 after a small test release the year before. Atari billed the Jaguar as being the first 64-bit console. Their whole advertising strategy, named Do the Math, pushed the idea that the current crop of 16 bit and 32 bit consoles were inferior due to the lower bitness. But this had a number of flaws, firstly the general public didn’t really understand the argument about bits and secondly it was fairly easy to argue that the Jaguar wasn’t 64 bit at all. The problem stemmed from the fact that the Jaguar has 3 main processors, a Motorola 68000, which is 16-bit externally, but 32-bit internally and two custom 32 bit RISC processors. On that evidence you’d say the Jaguar was, at best, 32 bit. However, the Jaguar transfers data over a 64 bit address line. This does, technically, make it a 64 bit machine. Regardless, none of this worked. 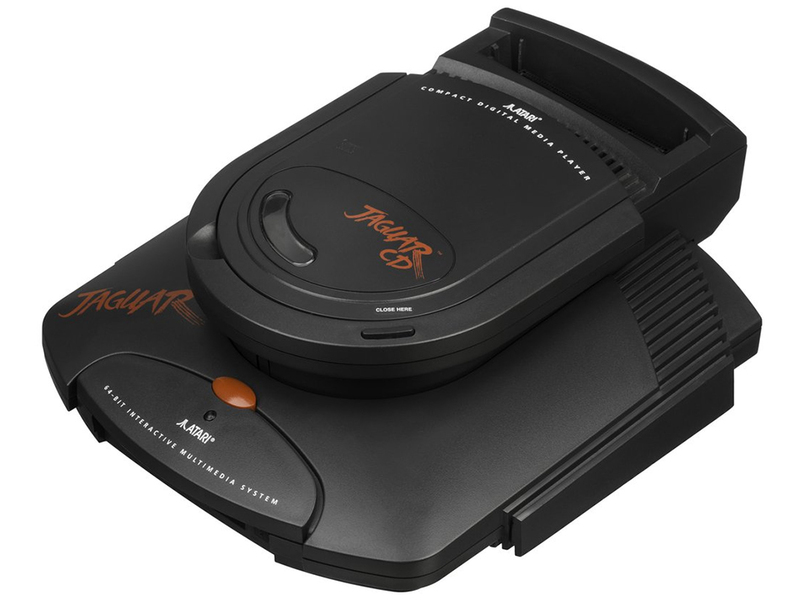 The Jaguar turned out to be difficult to develop for and Atari no longer had the might needed to compete against Sony and Sega. Games weren’t impressive compared to their Playstation and Saturn versions and developers left the platform in droves. We’re only just now finding out how powerful the Jaguar was. Modern day developers, with a greater understanding and better toolchains, are able to push the platform with greater results. It’s a shame that we’re just seeing that it could have competed in the 32 bit era. To try and keep the console alive Atari promised a number of peripherals including a VR headset and CD Addon. The CD Addon was the only one to see the light of day (although the VR headset was demonstrated). The Addon didn’t have many games and had proven unreliable, but the games that were released are fairly impressive. Now, the controller. It is not considered one of the best ever. It is ungainly, mostly due to the keypad that takes up most of the space. This keypad allows games to have lots of control options and games come with an overlay (like the Intellivision). It is helpful, but it makes for a really uncomfortable controller. Whilst the Atari 2600 didn’t start the console industry (the Fairchild Channel F came out a year before) it certainly popularised the idea of a machine capable of playing different games with the use of a ROM cartridge. Released in 1977 as the Atari VCS, it was later renamed to the 2600 mirroring it’s model number after it’s successor, the 5200, was released in 1982. Sensible pricing and some strategic licensing saw the 2600 achieve huge success. The Atari 2600 has been quoted as a reason for the games crash in the 80s due to Atari’s policy of allowing anyone to release games meaning that there were huge numbers of poor quality titles. In reality, of course, the crash was caused by many factors, although Atari were certainly key. Amstrad produced a fairly popular range of 8 bit computers during the 80s, in third place for most of the era in the UK after the Commodore 64 and Sinclair Spectrum. But Alan Sugar was well known for being able to sniff out a promising new market and so, when Nintendo and Sega hit the shores he realised he could take his existing 8 bit system, remove the keyboard and leverage the existing range of games. They gave it a futuristic, spaceship design and bundled it with a joypad that was pretty reminiscent of the NES pad. On paper this was a good move, the Amstrad had an amazing library of games and could certainly compete with the NES and Master System. It already had joystick support, so converting games across was a breeze and Amstrad’s existing supply and sales chain would work for the new machine. But the GX4000 didn’t release until 1990, which meant that it was competing with the Mega Drive and then the Super Nintendo. Whilst it had a fighting chance against the 8 bit era, it was entirely outgunned in the 16 bit world, they weren’t the only company to make this mistake though, Commodore followed with the C64GS. There is a fairly large software library for the GX4000 and developers have ported other titles across in recent times. There are a couple of issues to look out for. The PSU is not great and can cause component damage to the GX4000 if it’s unplugged or plugged in whilst turned on (usually this just means you have to replace the voltage regulator). It’s recommended you use a replacement PSU (9 – 12v 1a center positive) instead of the included one. The history of Commodore is long and complicated. But by the time the gaming industry recovered from the crash they were doing ok with the Amiga platform. But this was due to change, Europe had been a stronghold for them but the NES and, to a lesser extent, Sega MasterSystem were about to hit and hit hard. Commodore tried a couple of times to compete, first with a consolised version of their hit Commodore 64 8-bit computer and then with a living room friendly version of their Amiga platform, the CDTV. Both were huge flops. The C64 Game System just didn’t have the power and the CDTV was a confusing and expensive system. Whilst it had some power it just wasn’t marketed well. Their final attempt was again based on the Amiga, but this time it got pretty much everything correct. The CD32 was the first 32 bit console and was based on the Amiga 1200, in fact with the addition of an extension board it was possible to add peripherals like a keyboard and mouse to make it a fully fledged computer. The machine itself was powerful, priced fairly well and had the advantage of having a library of existing Amiga titles that could be easily ported across. The controller is a fairly weird inverted look, but is surprisingly comfortable. The buttons, however, feel slightly cheap, as does the D-Pad. There are some truly great titles for the CD32 and programmers, even now, are porting across other Amiga titles across, including the awesome Supercars 2 by Gremlin. Unfortunately, despite a strong start, the CD32 failed selling just 100,000 units. This was due to a number of factors, first Commodore missed a patent payment to XOR. This meant that they were unable to sell the CD32 in America. Then their available stock was stuck in the Philippines, the factory refused to release it due to an outstanding bill. Unable to pay the bill, the patent payment or to sell more units, Commodore filed for Bankruptcy. A few companies purchased the Commodore name but they didn’t want to release new machines, just use the name to shift various items. An ignominious end to a revolutionary company. Bubble Bobble is a static screen platformer released by Taito in 1986. We take a look at the Virtual Reality game, Giant Cop. Giant Missions, Giant Fun in pint sized Micro City. You are the Giant Cop. Use your size to your advantage to explore the open world, find hidden interactive objects and tower over the city uncovering a criminal plot that threatens Micro City. Immersive open world – the city and its people react to your every move. Narrative focused – a deep narrative experience, with satirical humor. Sandbox gameplay – explore the open world, find hidden interactive objects and tower over the city uncovering a criminal plot that threatens Micro City. Missions – you will be tasked with ridding the city of the savage cabbage, cleaning up neighbourhood crimes like noise complaints and keeping pesky protests under control. Vibrant 70’s style and soundtrack – we know you can dig it. We love the NEC console range so we decided to make a video about them. Although their contribution to the console world is largely forgotten, and often ignored, we still believe they added a lot. Including such classics as the PC Engine / TurboGrafx 16 and the largely ignored failure that was the PC-FX. We also take a look at some of the peripherals and the GT handheld. Here’s the Pinout for the Accessory port on the Fujitsu Car Marty. This will allow you to get video out. Port as seen from the back of the machine. IMPORTANT: The metal shielding that makes up the ENTIRE port is grounded, so you have to make sure all your non-ground connections aren’t touching it. 1 Navigation Control 12 ?